Welcome to Bark Busters Home Dog Training Coventry. My name is Emma and I’m your local dog behaviour therapist. I'm here to help you with your general training needs or to resolve all your dog’s behaviour problems. My training is one-to-one and conducted in your home where you and your dog are less stressed, most relaxed, and where you can take the time to focus on your dog without distractions. I come to you at a time that suits you and we work together to resolve those unwanted behaviours that are causing you problems and putting strain on your relationship with your dog; and maybe with other members of your family too. I’ve owned dogs for over 20 years and before I was a trainer, my background was in dog grooming. Grooming brought me into contact with many challenging dogs and their loving, but frustrated owners. Many of my customers would talk to me about the various behaviour problems they were struggling with, and I was able to share my experiences and provide advice. I was always delighted when customers reported back to me that the advice and tips I had given had helped them with their dog’s challenging behaviour. I have always been so committed to helping people identify the reasons behind their dog’s bad behaviour and helping them, and their dog, overcome the problems and live more happily together. I jumped at the chance to make the move into dog training as a Bark Buster dog behaviour therapist when the opportunity arose in the Coventry area. I work with many different breeds and many different size dogs. Each dog has its own issues and I know the importance of understanding how dogs use body language to communicate, why they need to be handled considerately and why they need to feel confident in person who is leading. I also love meeting dog owners through my work and I am committed to providing great customer service. My system is straight forward, easy to use and understand, by both you and your dog. There are no physical harsh methods and I believe hands are for praise and reward. We will work together to ensure that your dog is listening to your voice tones, watching your body language and understands what you want from him/her. I can help you with all problems such as aggression to other dogs, aggression to people, sibling rivalry, separation anxiety, excessive barking, destructive behaviour, toileting, boisterousness, pulling on the lead, recall and much more… I also offer puppy training so that you can get off to the right start with your puppy. Our lessons will be packed full of activities and information so that you feel you have lots to continue to work with. You will receive lots of written information and follow-up training tips to help you absorb and consolidate what you have learnt. I want to ensure you get the best value possible from our training system. Our written Support Guarantee will also give you peace of mind that I will return, free of charge, to support and guide you through the term that you have purchased. You can feel confident knowing that I am only a phone call or an email away from continuing to help you if you struggle. 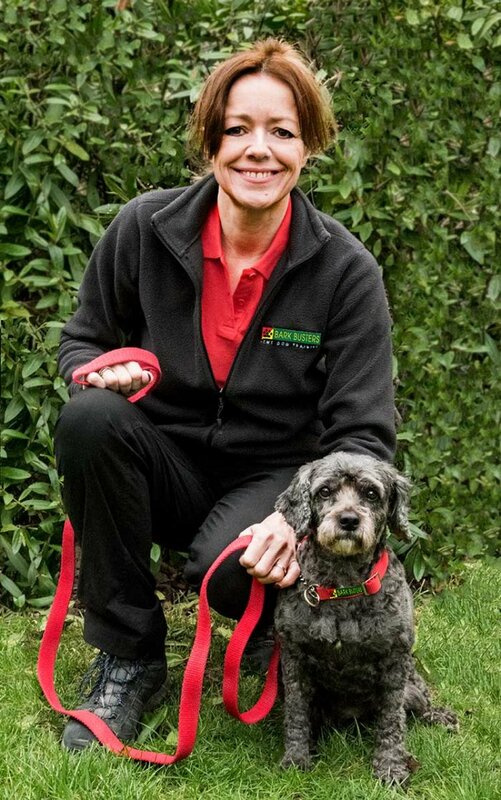 I’d love to help you find a way towards a better relationship with your dog so please do give me a call on 0808 100 4071 or simply click the red button above, to book your training, and I hope to meet you very soon. 92.3% of my clients rate their experience with Bark Busters as 4 or 5 out of 5 stars. 92.3% of my clients would recommend Bark Busters to their friends and neighbours. 92.3% of my clients think that their dog responded to the training. Average rating 4.7 out of 5 based on the last 13 reviews out of 13. Emma was a pleasure to have in our home. She was professional and gave some great advice and support to train my two husky dogs. I noticed a difference straight away. I will definitely take on board all the advice and teaching that Emma gave me. We could see the logic in the training concept and the need to control the dog by the specific word and body language. After one week Iam seeing some improvement in all aspects but it is not a short term fix.